United made a single change to their starting XI for the final game of 2018 with George Spiers coming into the defence in place of Ed Asafu-Adjaye who had a minor knock and took a place on the bench. 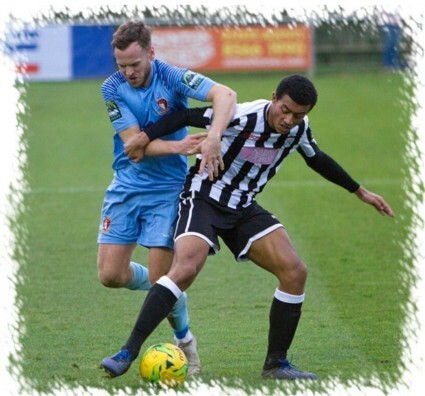 As has been the case in recent months, United were out of the blocks quickly with recent arrival Elliot Benyon putting Paul Hughes' side ahead in just the 3rd minute. Toby Little played a free-kick to Scott Bridges, his effort was cleared off the line with the ball going in the air whereby Benyon bundled it home between two defenders on the line at the far post (photo right). 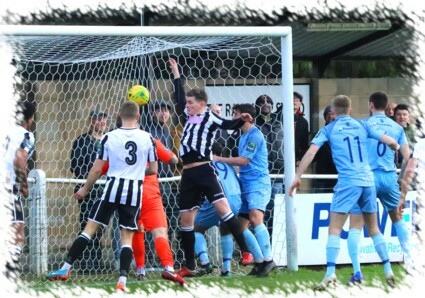 Magpies keeper Aaron Bufton was soon in action again as Lee Barney found Little raiding into the box, his low shot was pushed out to Tom Jelley who saw his drive blocked by the home defence. 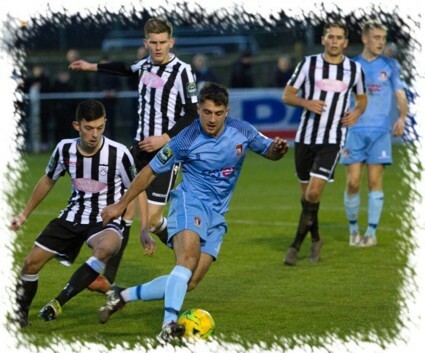 Liam McDevitt volleyed a Scott Donnelly free-kick wide of the target and a first effort towards the United goal from the home side saw Louis Bircham play a free-kick into the United box that his skipper Oliver Duffy met but his header was too high. Little went close for United with a curling free-kick and ten minutes later a smart move involving Donnelly, Bridges and Little saw Barney sent on his way, his drive from an acute angle being tipped onto the post and wide by Bufton. The resultant corner was headed goal wards by McDevitt only to be cleared off the line. Ten minutes from the break United's table toppers extended the lead. George Spiers brought the ball confidently out from defence and played it left to Little, the wing-back hitting a low cross that Benyon slid onto at the far post with the ball going under Bufton's dive. As the break approached the home side created their best two openings of the half, both falling to former United striker Tom Collins and both kept out by Andrew McCorkell in the United goal. The first effort saw Collins break from midfield with the United stopper pushing his we'll hit shot away, this was closely followed by a low Collins shot that McCorkell saved with Roddy Collins clearing up and it was 2-0 at the break. Two first half goals were only the prelude to a second half avalanche as eight more goals were rattled in, seven of them by the visitors to equal a club record victory. Once more it took three minutes from the first whistle for United to score. This time a free-kick was won on the tip of the "D", Bridges stepped up and promptly fired the ball past the wall and Bufton into the top corner of the Magpies net. 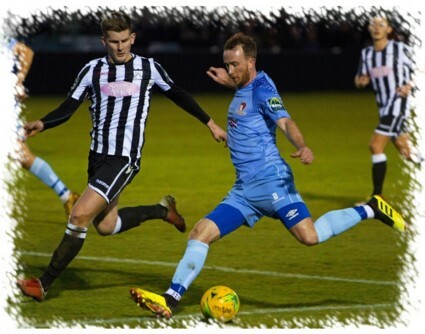 A minute later however the hosts had one back when Harry Tamplin rose highest to head home a corner after McCorkell had done well to block away a Femi Azeez effort initially. United seemed more than a little miffed by conceding and immediately pushed up looking for more. Josh Chamberlain saw a volley blocked and when the ball dropped to Barney his volley was off target. United were not to be denied two minutes later however, Little fired in a deep corner, Roddy Collins header was blocked with Benyon collecting the loose ball beyond the far post, his cross picking out Chamberlain in the middle and he leapt highest to head past Bufton from close range. Five minutes later United had numbers five and six courtesy of a Barney brace. His first saw him run onto a nice through ball to smash past Bufton and then minutes later he collected a Little cross, his initial effort was blocked out by Bufton but the United top scorer was not to be denied as he jumped onto the loose ball and fired home on the turn. On 66 minutes United threw on more fire power as Duncan Culley arrived in place of Chamberlain. The striker was soon into his stride moving on to a Barney pull back only for Bufton to push us effort wide. A quick break by the home side in the 71st minute saw the ball crossed to substitute and former United under 18 striker Harvey Killeen, the youngster being denied by McCorkell who was quickly off his line to gather in the ball. Culley was then put through, chipping the ball over Bufton but just too high while at the other end McCorkell confidently held a Calum Duffy drive from the corner of the United box. Bufton denied both Little and Culley before United struck three more times in the final seven minutes. First to find the net was Culley, the striker running on to a nice pass over the defence before smashing the ball past Bufton. A minute later Benyon was denied a hat-trick, Donnelly's quick thinking saw the skipper take a quick free-kick to Culley, he in turn found Benyon who beat Bufton only for the ball to come back off the post. At the other end McCorkell saved at the second attempt from Bircham as Killeen closed in before Culley controlled the ball and slid it to Barney who fired low into the bottom corner to complete his hat-trick. Number nine for United came on 88 minutes, Little collected on the left and not for the first time picked out his man in the middle, Culley stooping to head home his second of the game as United end the year 2018 two points clear at the top of the table with three games in hand on virtually every team below within the top ten. Photos by Ray Peploe (top) & Montimagemedia © (others) .